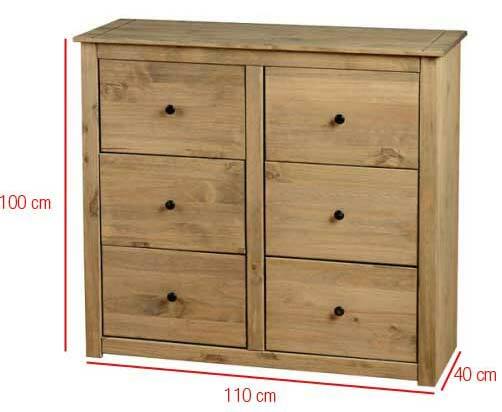 This 6 drawer chest is the perfect size for most bedrooms. The five drawers provide ideal, ample storage space for all of your folded clothes, whilst the large top surface is at an ideal height for you to use as a dressing table or the perfect surface to display other decorative items or photographs. The Panama range is made from 100% solid pine, giving this range a really great quality look and finish. This chest of drawers beautifully displays the wood's natural grain, with a light and versatile finish. The rounded, black metal handles finsih off the drawers perfectly, making this a great little looker. This chest is made from solid pine, with a plywood back and drawer bottoms. Complete with round metal handles. This Panama chest is really easy to take care of. Wipe over with a duster or dry cloth for a dust free finish. Try a damp cloth for tougher marks. When moving your drawers, as with any furniture, it is always best to lift rather than dragging or pushing as this could cause structural damage. Delivered flat packed, self-assembly will be required. Accompanied with easy to follow step by step instructions and all the fittings and fixtures you need all you will need to provide are your own tools. It is much easier to construct this item if you ask a friend for help. Question from Tersias: Asked on 10/07/2014 Does this chest of drawers have metal runners?